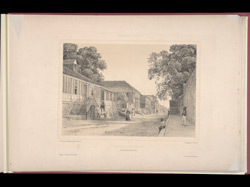 View of Church Street, Kingston from Adolphe Duperly's 'Daguerian Excursions in Jamaica.' A number of works used the daguerreotype as a basis for illustrations in the 1840s. Most commonly, the original plate was traced or otherwise copied and used as the basis for lithographic or other printing processes. This had the advantage that figures and other moving objects could be added to enliven scenes, which with the slow exposure time of the daguerreotype, would otherwise have lacked any human presence.